Hello Everyone! 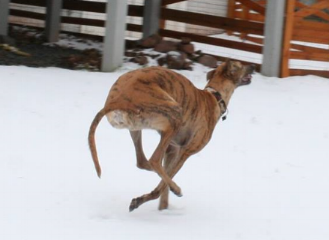 My name is “Lucky the Greyhound”. Everyone calls me Lucky because I was so very lucky that wonderful people at Blue Ridge Greyhound Adoption brought me home from the racetrack. Everything I’ve ever known is changing around me, but I am not looking to be pitied. What I’m looking for is guidance, leadership and to learn. If you want to adopt me, I’m sure you’ll want to make my transition, easier. Below are a few items to facilitate “our” transition and get me on the track to being your faithful companion. The first few days I am in your home, please do not invite people over to meet me. This is “our” bonding time and the time for me to get to know you. I need this time to relax and become accustomed to my new home and your rules. After about a week, I’ll be ready to expand my boundaries. You should be careful not overwhelm me in the very beginning. NO HUGGING PLEASE because I won’t understand what you are doing and it may frighten me. Most dogs like toys. However, prior to being rescued, I never had a toy before. One to two might be nice, but please don’t get too many. If there are too many, I may feel the need to begin resource guarding since I will feel the need to protect my stuff. I think either an Elk antler or a Nylabone would be good choices and maybe one soft stuffie to begin. Believe it or not, at the track we were mostly fed slop from a pickle bucket. So feeding me a good, healthy kibble will be appreciated and is essential. Here’s an idea to help you gain my respect and help me to recognize you as the food provider. During the first two weeks I’m with you, run your hands through my food as soon as you fill the bowl BUT before you place it for me to eat. By doing this, you are putting your scent on my food. Please DO NOT EVER place your hands in my food while I am eating. It can create problems that do not need to exist. It is best for me to eat 2 times a day although 3 times would be okay too. But please do not feed me only once a day or allow food to lay around so that I can eat whenever I want to. I don’t want to be a grazer or become lazy, unmotivated or untrainable! It’s not healthy for me physically or from a behavioral stand point. Now that you know about feeding me, I would like you to know how important it is for me to exercise. Taking me for walks will help me AND you to relax, and also will help me to learn about my new area gradually. Did you know that walking is the single most important factor in my bonding with you and your family? If I get scared on my walk, it’s probably because of something new that I don’t understand. All you have to do is be calm and walk on by and I will begin to accept and understand the new thing more easily. One more thing, try to avoid saying the words, “IT’s OKAY”. Did you know not everyone takes their Greyhound to training class? They must think we are a stupid breed. How wrong they are! I am here to tell you that we are smart and training that uses positive reinforcement helps us to become even smarter. I have friends who are in a training class once a week and a few friends who actually take Agility Classes. If you take me to class, I will thrive and we definitely will have fun together. You will be the most important factor in my development so please remember a few key rules. There is no need to yell at me, please never, ever hit me, and please try not to use my name when you correct me. Using short commands are great and will help me to learn more quickly. Unfortunately, my brain does not have a speech or language center and I cannot understand a conversation. I will only know the words that I learn from you. One of the most important things you need to know is that when I was a racing dog, I slept in a crate every night and I was NEVER touched while I was sleeping. Please, Please Do Not allow anyone to handle me when I am laying down (even if my eyes are open). I actually could still be asleep and it would terrify me. If you need me to wake up, call my name and I will rise and shine. Teaching everyone in your house to respect my boundaries and ignore me when I am laying down is very important to all of us. I’d like to bond with some other dogs but….please don’t put us face-to-face on a leash, cuz I might misread the signals and believe I am being challenged to fight. Instead, let’s go for a walk together and meet later in my new friend’s home or property. Just as walking together will help you and I bond, it will also help me to bond with another dog. Now you have some simple but important guidelines to help with my development but I realize that at times even the best intentions can go wrong and things happen that we do not anticipate. Should this occur, please call Doggy911 and ask for Bob Witmer as he will help explain what I need and how I am perceiving things. His number is 570-556-0720 or you can contact him on Facebook at Doggy911. I am looking forward to a long, happy and fun life together and THANK YOU for adopting me!